They're finally available. No, it's not the Xbox 360. Or even the new 1GB iPod Nano. No, it's WAY better--your very own Billwildered shirt. Come on...you know you want one. Seriously, you better get one. Sherioushly, there's this really cool site I learned about on Lifehacker last week called SnapShirts that will analyze your blog/website and create a word cloud (similar to a tag cloud) based on the most used words on your main page. 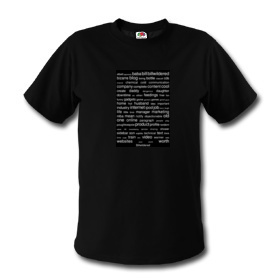 Then you can have them put the word cloud on shirts, mouse pads, clocks, and other items. Get 'em here while they're hot.